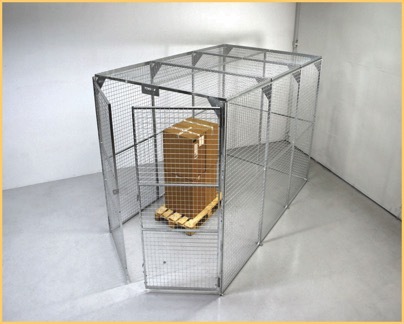 Secure valuable items and effects with steel mesh cages. delivery direct to your premises. and protect valuable plant and equipment indoors or out. Single & double door versions complete with fittings suitable for padlocks. Fixings and mesh roof overs included as standard. or can be hot dipped galvanised for external locations. providing security for premises and stock. high-risk items, IT equipment and many other valuable products. 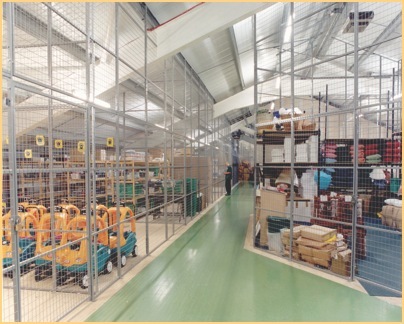 All mesh partitions can be supplied and from standard panels or built to suit your particular application. Hinged or sliding door access with a choice of locking mechanisms. Quality systems approved and made in the EU. Mesh clad shelving systems and mesh shelf decks. Please contact us for further details on all mesh security products.